New Platinum Conference 2017: Motivating, enlightening, entertaining! New Platinums arrived in Grand Rapids, Michigan, on Sunday, June 4, excited to spend a few days with emerging IBO Leaders, Amway™ Corporate staff, and the IBOAI®. Immediately following registration, Platinums were warmly greeted by IBOAI staff and presented with a distinctive IBOAI logo notebook and pen. New Platinums also received literature on the IBOAI, including the outstanding Year in Review brochure. Conference arrival day concluded with a wonderful welcome reception and dinner in the evening - abundant smiles, hugs, and laughter – accompanied by frequent photo-taking and posting on social media. Facebook®, twitter®, and Instagram® are buzzing this week with New Platinum updates! Monday began with the all-important NPC Business Meeting. 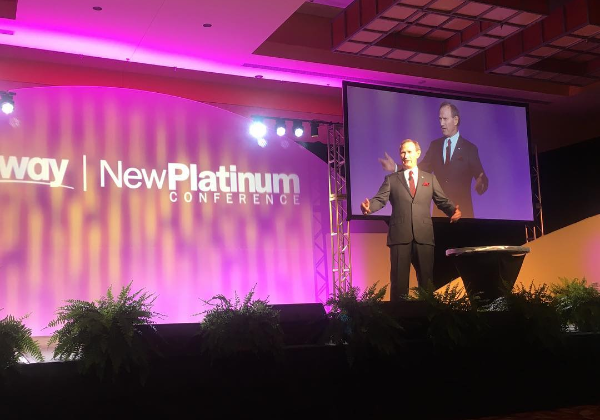 When Amway Canada Sales Manager, Jeff Johnson, kicked off the meeting in his spirited style, the energy and excitement level of the Platinums rose rapidly. These new leaders are enthusiastic and cheered loudly when the first speaker, Mike Cazer, Amway Chief Operating Officer, took the stage. Focusing on IBO First, Mike recognized the New Platinums on their success and congratulated them on achieving their first major milestone. He firmly believes partnership is what makes the Amway Business Opportunity special and remains the key to its success today. Mike also shared information on Amway's future investments in technology, including the digital experience, and also in training and education. He assured the new Platinums that sustainable success for all IBOs is at the heart the Corporation does. He closed with the sentiment, "Amway stands ready and committed to you, the IBO, to reach your goals." Jim Ayres, Managing Director of Amway North America (ANA) and Rajneesh Chopra, Vice President of U.S. Sales also spoke during the Business Meeting. Jim shared his story of meeting Rich DeVos for the first time as a new Amway employee. As a new hire, he realized what an opportunity it was to work for a company that believes in people and their success, no matter what their background. He often heard Rich say to his employees and to IBOs, "Great job. Thank you. Keep it going!" Jim expressed this same message to New Platinums. Special IBO guest speakers, Misael and Nayeli Lopez, earned an invitation to NPC last year and returned this year to share their personal story of starting out in the Business and succeeding. Originally, they became IBOs to earn some extra income and spend more time with their girls. Several of their remarks centered on NPC and how it taught them more about the great quality of the Amway products, how to market the products, and the power of setting of appropriate business goals. To applause and cheers, Rajneesh Chopra took the stage following the guest speakers. He referenced the different stages of the Business and shared key success factors in growing beyond the Platinum level. Next, the audience warmly welcomed Bob Andrews on stage to talk about the "Foundation of Success". As a Crown, an IBO for 47 years, and current IBOAI Vice Chairman, Bob knows and loves this Business. He also has a great sense of humor and it shined as he shared stories and advice with the New Platinums. Bob recommended IBOs secure their foundation for success by being optimistic - as he advised, "Optimism gives you the power to turn a bad situation into a good one. Determination gives you the focus to achieve your goals. Resiliency is what you need to weather the storms that will come into your life." As Bob exited the stage, the new Platinums were on their feet - applauding, cheering, and whistling. The room was aglow with optimism and energized! The remainder of this week, Platinums attend education sessions, take an exclusive tour of the Amway World Headquarters, and enjoy fabulous cuisine and evening celebrations.